It’s time for #FoodieExtravaganza again! Our theme for this month is Oktoberfest and it’s being hosted by Sue of Palatable Pastime. 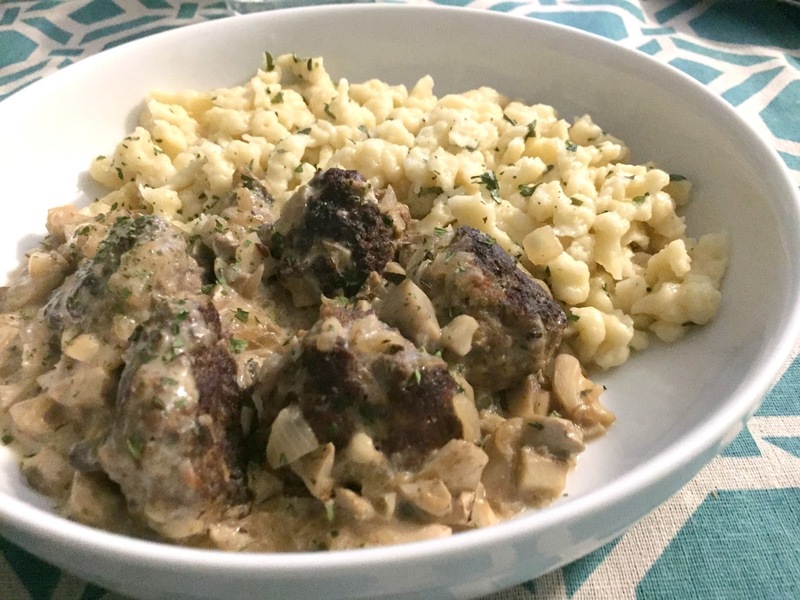 If you’ve had Stroganoff or Swedish Meatballs, this dish reminds me of that. It uses ingredients that almost everyone has in their pantry or fridge or are very easy to acquire. That’s something I love about traditional recipes. Today, there’s are recipes out there that require trips to two different grocery stores and a specialty market or online order just to get all of the ingredients. Which can be fun sometimes, but other times you just want to pop into the local store and pick up what you need without any hassle. Similar to Swedish Meatballs, these German meatballs pair perfectly with spaetzle, a homemade noodle. 1. First prepare the meatballs by combining the ground beef, egg, milk, bread crumbs, parsley, poultry seasoning, salt and pepper together in a medium bowl. Form into 1 ½ inch balls, about 24 in total. 2. Place meatballs in a large skillet and cook over medium high heat until browned on all sides. Drain any fat. Add the beef broth, mushrooms and onions to the skillet and reduce the heat to medium low. Cover, and allow to simmer for 10 minutes. 4. Add the sour cream mixture to the meatballs and stir to combine. Reduce heat to low and cover. 5. Bring a large pot of lightly salted water to a boil. 6. To prepare the spaetzle, sift the flour and salt into a large bowl. Alternating, slowly add in the beaten eggs and milk, stirring until a firm, elastic dough is formed. 7. Transfer the dough into a spaetzle maker and drop into the boiling water. Spaetzle are done when they float to the top. 8. Use a strainer or slotted spoon to remove from the water and place in a large bowl. Add the butter and garlic powder and stir until all are coated. 9. Divide the spaetzle mixture onto plates. Divide the meatball mixture and place on top of the spaetzle. Serve immediately. It’s uncharacteristic of me, but I didn’t get a chance to make this recipe until this past weekend. While everyone else was eating burgers and hot dogs, we took a German detour. The recipe is pretty easy to make, you can get the meatballs and sauce ingredients together ahead of time as well as your spaetzle dough. The hardest part was pushing the spaetzle through the maker, but only because we had painted the day before and my arm was already sore from a heavier than usual paint roller. Kinda boring and bland? Hmmmm….looks to me to be kinda warm and comforting. I agree…no more taste testing for him. Whenever I see Spaetzle on a menu, I can't help but order it. It truly is comfort food at its best and I can't get enough of it. Have fun at Oktoberfest, I can't wait to hear how it goes! Spaetzle is so amazing can't wait to try this out. 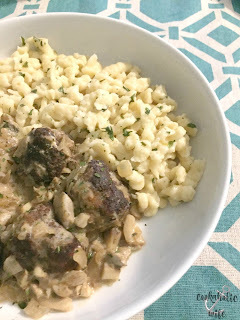 I always loved spaetzle when we visited Germany and Austria when I was a child. I have started making it a bit recently as we love it too. Looks like a comforting meal. Yum! 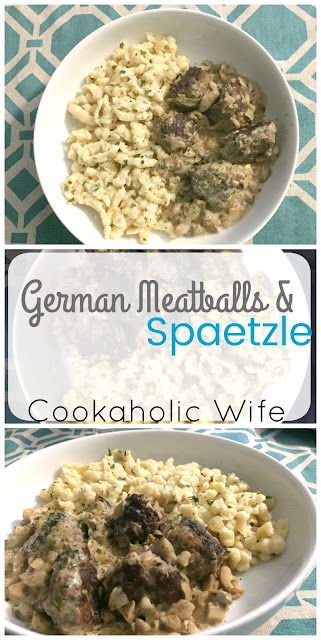 My husband often calls my German cooking on the bland side. It is comfort food for me though. My Spätzlespresse is one of my most used kitchen gadgets. 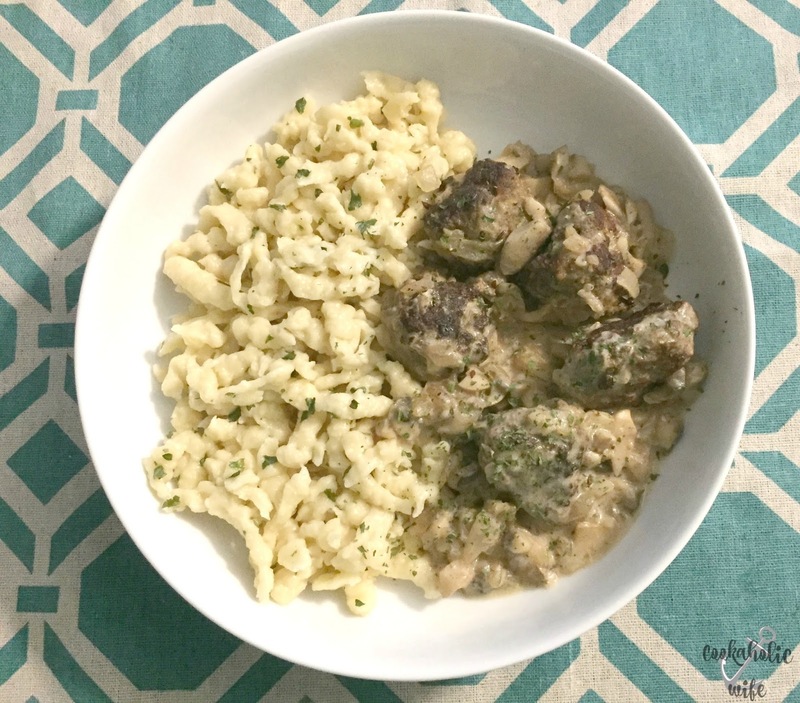 Love your pairing with the meatballs and mushroom sauce.